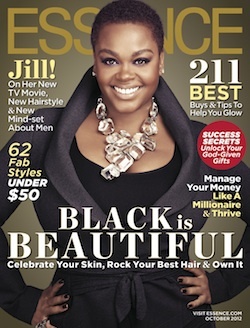 Jill Scott graces the cover of Essence's October issue with her amazing natural hair. Jill who has previously relaxed her hair for over two years, is stepping out into the spotlight and onto a Essence’s cover with her natural hair. We got a preview of this new ‘do from Jill at her performance at the Somersot House in England where she rocked her big chopped hair on stage. This is the second time Jill has stepped out into the spotlight with a natural hair style and we think she looks beautiful, radiant and better than ever. We're sure the natural hair community is very happy to see her rocking her naturally curly hair again. We know Jill is a fan of weaves wigs, blow-drying and straightening her hair, but we think her natural hair looks best! There's nothing wrong with trying different hairstyles or experimenting, but our vote is natural! "Jill Scott has much to be excited about these days. After a tumultuous few years that saw the end of her first marriage, a broken engagement to her son’s father, an acrimonious split from her longtime record label Hidden Beach and the abrupt end of her HBO series The No. 1 Ladies’ Detective Agency, life is looking up for the singer. She’s a mother and a maverick; she’s starring in a TV movie — Lifetime’s all-Black revamp of the 1980s classic Steel Magnolias — and she’s still packing in crowds on tour. Here, the soulful songstress—rocking a close-cropped natural for the October issue cover—talks to ESSENCE about 'the lights coming on' after turning 40, finding her stride…and what’s next on the horizon." "Scott has always enjoyed experimenting with her hair and loves a good wig — 'hair hats,' she calls them — but lately she's been rocking a close-cropped natural. It suits her. 'This,' she says, stroking her head, 'is the simplest form of myself. I look in the mirror and it's like, Hey, there you go. What's up, girl?'" Make sure to check out the October issue of Essence, on stands now, to read the full story. Read on to find out how to get Jill’s cover girl look. We love Jill’s hair au naturel — no blow dryer, no flat iron, no weave, no extensions or wigs, just a crop of tight coils framing her beautiful face. Rock it Girl! To help Jill on her second round of her natural journey we’ve put together five tips. If you're rocking a TWA or have recently big chopped, these tips are for you too! Moisture is the key to your new natural hair. To grow out long strong hair you need to keep it moisturized from the start. Reduce your washing to every few days – go as long as you can. When you do wash your hair, use a creamy shampoo or co-wash for best results. Once a week, do a deep conditioning treatment for at least 30 minutes to infuse your hair with more moisturize than it gets daily. As mentioned above, you need to wash less and condition more so you’ll need to do some experimenting, but cleanse your scalp anywhere from every two days to every two weeks. Keeping a clean and healthy scalp is key to growing long, strong and healthy hair. Don’t forget about the root of your hair… the scalp! Hair oils can moisturize the scalp and stimulate its pores to produce more healthy, natural oils. Supplements and a good diet are key to healthy locks. Take care of yourself by eating lots of fresh nutrient rich foods, like veggies and fruits, and cutting back on processed foods. Choose water over soft drinks more often. You need to nourish your hair from the outside and the inside. Make sure to get adequate nutrition, and supplement with biotin, as it has been shown to increase hair growth. Just as eating better keeps you healthy, taking care of your hair from the root helps you to have healthy rather than repaired hair. Check out these top 10 healthy hair foods to learn more. Your natural hair is delicate. You need to be very gentle when caring for it. Make sure to avoid things that can cause breakage. Use a conditioner that creates slip and allows the comb to glide through without snagging or breaking. Start at the bottom and gently work your way up. Sleeping on satin pillows greatly decreases the friction between hair and cotton pillowcases. Satin also helps you to keep your curls shiny by not absorbing the vital natural oils in your hair needed to keep your hair moisturized. Your newly natural hair needs different products than your relaxed or constantly straighten hair. Start fresh – get yourself a new regimen of products. Read reviews and find out what’s right for you. Key things to keep in mind when caring for your recently chopped hair is always hydrate with a daily moisturizer and a leave-in conditioner spray. Make it easy on yourself and get a custom cocktail made just for your new natural hair! Check out CurlMart’s Transitioning Tonic – a bundle of products selected by experts to help you rock that TWA! You can also learn more about how to care for the length of your hair on our Texture Typing page. What do you think about Jill’s natural look? Tell us!